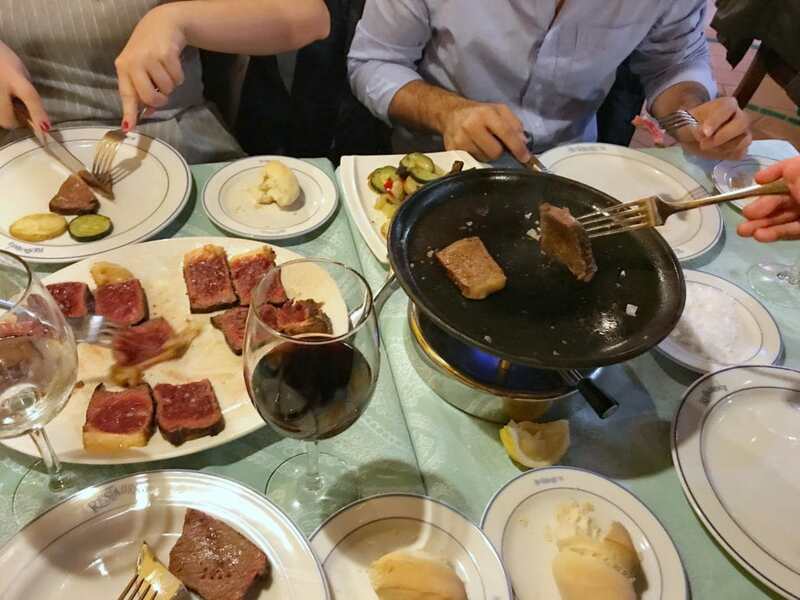 Today Lindsey shares her tips for the 12 must try foods in Cordoba – and as an adopted Cordobesa herself she knows her stuff! I still laugh when I think about my first attempts at eating out in Cordoba back when I first visited the city in October 2015. I’d been in Spain for three weeks, living in a small town in Almeria province, and had decided to visit the ciudad califal for the long holiday weekend at the beginning of the month. After a confusing experience in Almeria shortly after I’d arrived in Spain (which found me accidentally trying to order food at 5 p.m. only to be told the kitchen was closed), I was determined not to look like a clueless guiri on my solo trip to Cordoba. Armed with newfound knowledge, I found a promising-looking bar come lunchtime (which I now knew was around 2 p.m.) and grabbed a seat out on the sunny terrace. I ordered a caña, keenly aware that there were no menus in sight and assumed I would get one when the server returned with my drink. Instead, my beer came with a small dish of free potato chips. Being the non-confrontational person that I am (and also afraid of coming off as an uncultured foreigner), I munched on the chips and decided to try my luck elsewhere. This place must not be serving lunch, I thought. The word “salmorejo” was not yet in my vocabulary! But the next bar I tried was no different, except the free tapa was a small dish of mixed nuts. And so my attempts to eat lunch continued fruitlessly thanks to my own doubts and stubborn refusal to look like I didn’t know what I was doing. I was starving for the rest of the afternoon, and the next day reluctantly opted to go to lunch at a mediocre touristy restaurant near the Mezquita due to the sheer fact that I’d seen people actually eating in it the day before. Luckily, now that I’ve lived in Cordoba for many years, I’m much more familiar with the unwritten rules of eating out. The best part: I’ve discovered the absolute best local cuisine this charming city has to offer, and now consider my adopted hometown to be one of my favorite foodie cities in Spain. 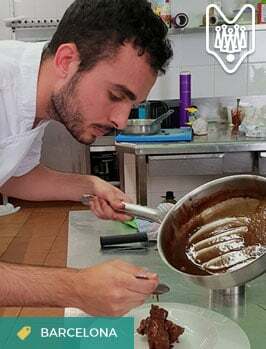 Narrowing down my list to only 12 must-try foods in Cordoba wasn’t easy due to the sheer variety of great bites available here, but it was a challenge I was happy to take on. 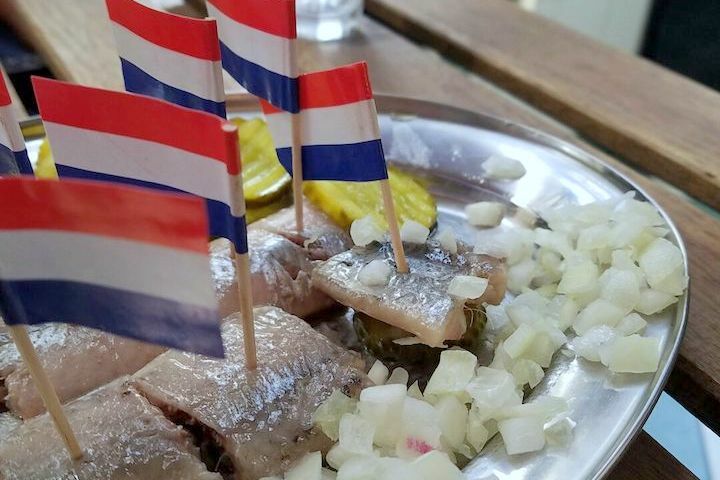 Don’t miss these local dishes on your next visit! One of the most famous dishes from Cordoba, salmorejo is a thick, cold, tomato-based soup closely related to gazpacho. Salmorejo has its roots in Cordoba, and it’s a dish locals are undeniably proud of. The recipe exemplifies the beautiful simplicity of Spanish cuisine: all you need are tomatoes, garlic, bread, olive oil, salt, and sherry vinegar. Top it off with some hard-boiled eggs or jamón, and you’ve got a winner! Believe it or not, though, the tomatoes that play such an important role in the salmorejo we know and love today actually weren’t part of the original recipe! The first versions of the dish, developed in Moorish Cordoba centuries ago, consisted of garlic, bread, salt, oil and vinegar. The recipe remained quite similar for hundreds of years, until the early 20th century, when it became popular to add a tomato to the mixture on special occasions. Little by little, the small but mighty tomato gained popularity, and soon became the main ingredient in the dish. 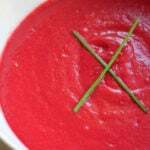 They are so key that the quality of the tomatoes used can truly make or break your salmorejo. 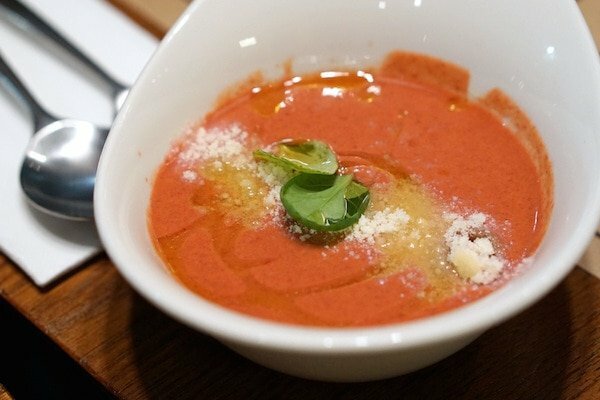 A perfect bowl of salmorejo! Today, salmorejo is a beloved staple of local cuisine here in Cordoba, and an absolute must eat on the sweltering summer days we experience. It’s healthy, refreshing, and especially fantastic when served with plenty of Spain’s perfectly crusty bread to scoop up every last drop. 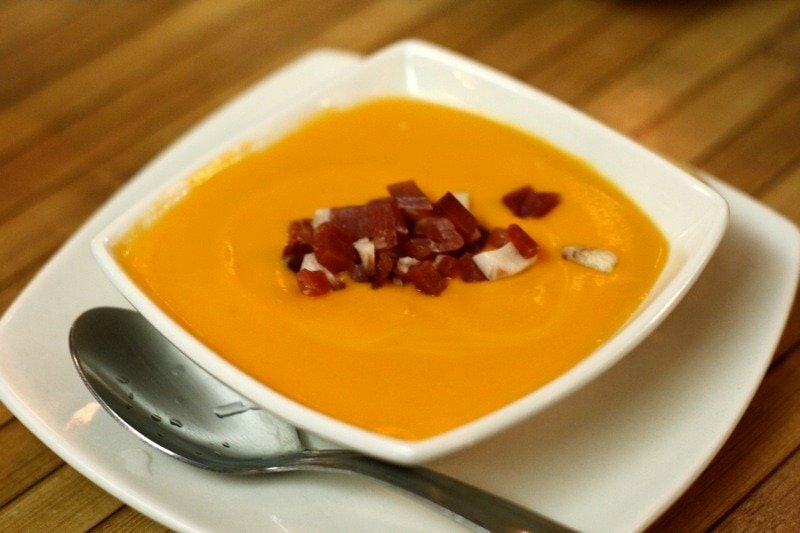 Where can you find the best salmorejo in Cordoba? I’ve tried salmorejo all over the city, and I’d have to say that my favorite is at El Rincón de Carmen (Calle Romero, 4). This lovely traditional restaurant in the judería has one of my favorite outdoor patios in Cordoba—the perfect place to enjoy an al fresco meal on a nice day! I also love the incredible variety of flavors at the La Salmoreteca stall inside Mercado Victoria (Paseo de la Victoria, s/n), Cordoba’s bustling modern gastro market. Whenever I mention to fellow Americans that one of my favorite Spanish dishes is stewed bull’s tail, they usually make a weird face and tell me how strange it sounds. To an extent, I get it, but don’t knock it till you try it. To create this classic Cordoba dish, bull’s tail (or oxtail, as is more common nowadays) simmers to perfection for hours in a rich red wine sauce. The result is unbelievably tender meat that falls apart as soon as you sink your fork into it, with flavors that practically sing. Unsurprisingly, rabo de toro has its roots in the glory days of bullfighting here in Cordoba. After bullfights in the late 19th century, it was quite common for the city’s poorest residents to gather at the gates of the arena, where the proud torero would distribute the less-desirable parts of the slaughtered animal: the ears, organs, and tail, under the assumption that little usable meat could come from these parts. However, the poor but resourceful housewives and cooks soon discovered that the tail did contain quite a bit of meat, and in fact just a few tails were enough to provide dinner for dozens of people. Rich, hearty rabo de toro is a must in Cordoba. Despite its humble working-class roots, rabo de toro is now one of the pricier must-try foods in Cordoba, with portions in the best restaurants often going for more than €20. However, if there’s one dish that’s absolutely worth the splurge, this would be it. Which places serve up the best rabo de toro in Cordoba? 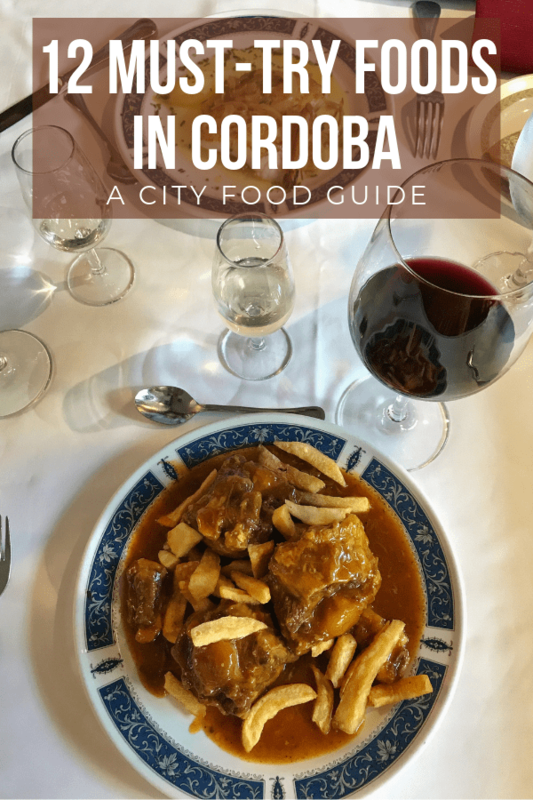 Everyone I’ve ever talked to about this dish—from born-and-bred Cordoba natives to well-traveled foodie friends—has told me that the best rabo de toro in Cordoba comes from El Caballo Rojo (Calle Cardenal Herrero, 28). While I agree that theirs is quite good, I actually prefer the version from La Siesta (Calle Enrique Romero Torres, junto a Plaza del Potro), which in my opinion is more tender and has a more flavorful sauce. Also worth mentioning are the rabo de toro Argentinian-style empanadas at La Tranquera (Calle Cardenal Gonzalez, 53), a fun fusion spot that masterfully blends the flavors of Argentina and Andalusia. Try it: Making rabo de toro at home requires time and patience, but the end results are well worth it. 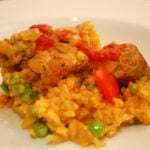 Try Lauren’s rabo de toro recipe! What could possibly be better than a deep-fried pork roll? 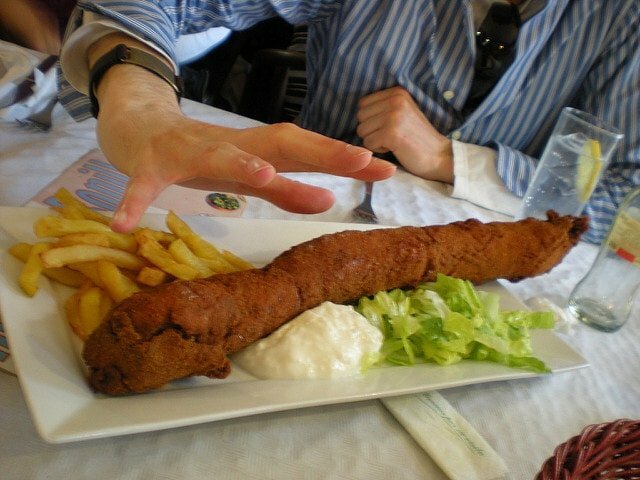 Not much, and that’s why flamenquín earns a mention as one of the definitive must try foods in Cordoba. Cured ham and pork loin are rolled together and deep-fried (though some recipes include other ingredients, such as cheese, in the filling). Healthy? Not very. Delicious? You bet. 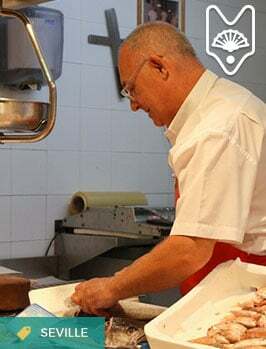 The origins of flamenquín are muddled, with some sources claiming the dish was invented in the village of Bujalance in Cordoba province, while others trace it back to Andújar in neighorhing Jaén. 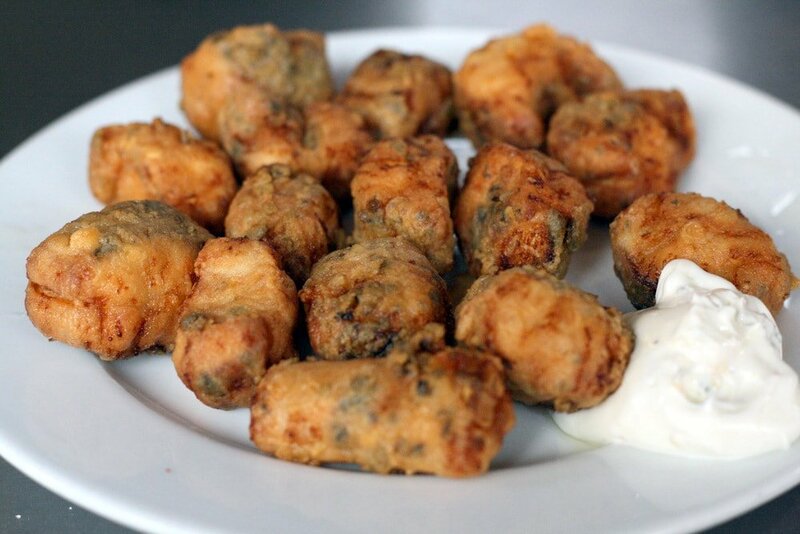 However, Cordoba residents are rightly proud of this popular delicacy, so we like to claim it for ourselves! Want to eat the most famous flamenquín in Cordoba? Cafe-Bar Hermanos Bonillo (Calle Sagunto, 27) serves up legendary flamenquines practically as long as your forearm. This place is so famous in Cordoba that when I was working as a language assistant at a high school just around the corner, my students actually applauded when I mentioned having eaten there. Bring a hungry friend (or several)—devouring this beast on your own can prove difficult for even the most die-hard carnivore. 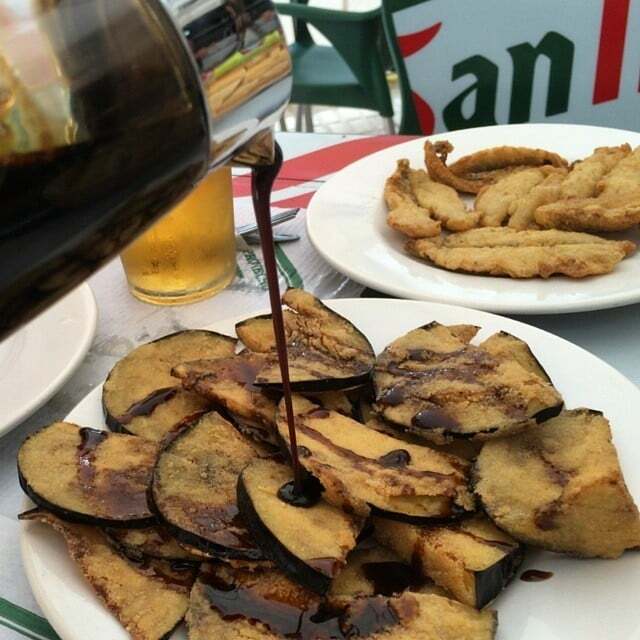 I’d never really eaten eggplant before coming to Spain, and I certainly never expected that the first version of it I tried would be fried and drizzled with honey. The combination of the crispy fried eggplant and the sweet honey manages to work together in magical ways. It’s no wonder why this strange-sounding yet tasty dish is a staple on menus all over Cordoba. It’s not just your regular run-of-the-mill honey, though. Despite its name, the miel in this dish usually refers to miel de caña, which is something more along the lines of cane syrup or sugar molasses. I’ve made them with regular honey when I didn’t have any miel de caña at home and it works in a pinch, but the thicker flavor of the molasses definitely makes a difference. An unlikely but delicious combination: berenjenas con miel! The only thing missing so far from this list of must try foods in Cordoba is a little spice. Spanish food in general is quite mild, and while that doesn’t mean the dishes here don’t have incredible flavor, sometimes a little heat is nice. Enter pinchos morunos, also known as pinchitos. As Lauren explains in her recipe, the name (literally translated as something like “Moorish pork skewers”) is misleading, considering that the Moors who once ruled the Iberian Peninsula didn’t eat pork for religious reasons. The spice blend, though, is authentic, and the mixture of cumin, coriander, turmeric, cayenne and more will transport you to northern Africa in just a single bite. Hundreds of years later, the incredible flavors of this magical spice combination has stood the test of time. The marriage of these spices with pork (arguably Spain’s favorite meat) perfectly bridges the past and present of Andalusian cuisine. 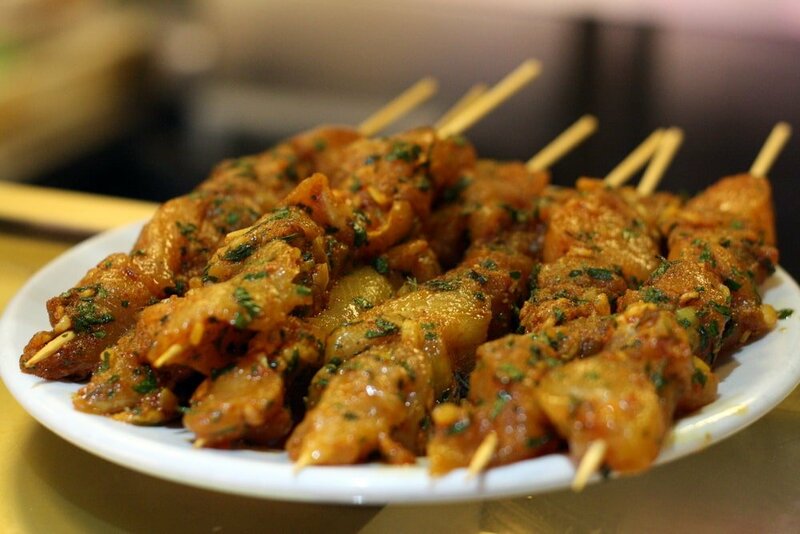 Where can you find the best pinchos morunos in Cordoba? My favorite pinchos morunos in town come from El Tema (Calle Periodista José Luis de Córdoba, 22), a traditional Spanish restaurant that my boyfriend’s family loves. It’s a bit off the beaten path, but not too far from the fairgrounds. Rather than spending money on pricey fair food, we’ll usually come here for dinner and order up a round of pinchitos before heading off to feria. Delicious Pinchos Morunos all marinated and ready for the grill! That’s right—snails! Come late February, stalls spring up all throughout the city serving up nothing but cups of these tiny mollusks floating in an aromatic broth. All throughout the spring, locals head en masse to the temporary stalls, crowding around tables as they share snails and beer with family and friends. It’s a true springtime ritual, and one that might seem odd to American visitors given the main course. 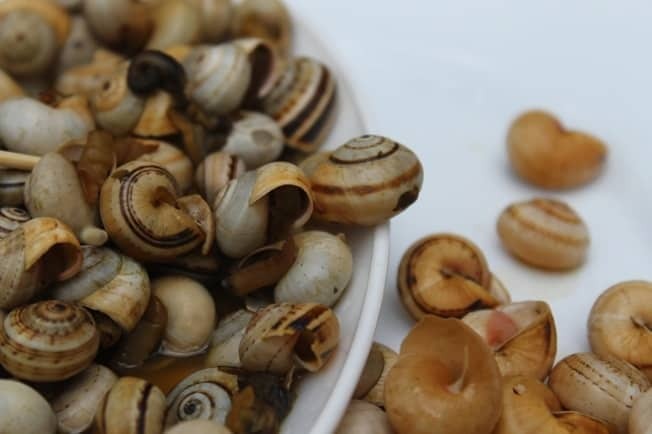 While caracoles aren’t my personal favorite, you can’t visit Cordoba in the springtime without trying them. Step out of your comfort zone and cross this unexpected item off your foodie bucket list! See also: Caracoles are a big deal in Seville, too—see where to eat them in the Andalusian capital. A big bowl of snails in broth. Confession time: my two most disliked foods are eggs and onions. As a result, my first year in Spain was full of figuring out polite ways to refuse or avoid eating the country’s most ubiquitous dish, which is made mainly of the former and often contains the latter as well. Then, one day shortly after I moved to Cordoba, I found myself eating over at my boyfriend’s parents’ home for the first time. Not wanting to make a bad impression, I cut myself off a small slice of his mom’s homemade tortilla and prayed I wouldn’t involuntarily wince if I disliked it. Quite the opposite, in fact. That first bite was absolute heaven in the most unexpected way. Soon I was helping myself to a much larger slice after I’d devoured the first. Tortilla de patatas is Spanish food at its absolute best: pure, simple ingredients that come together to make something truly amazing. 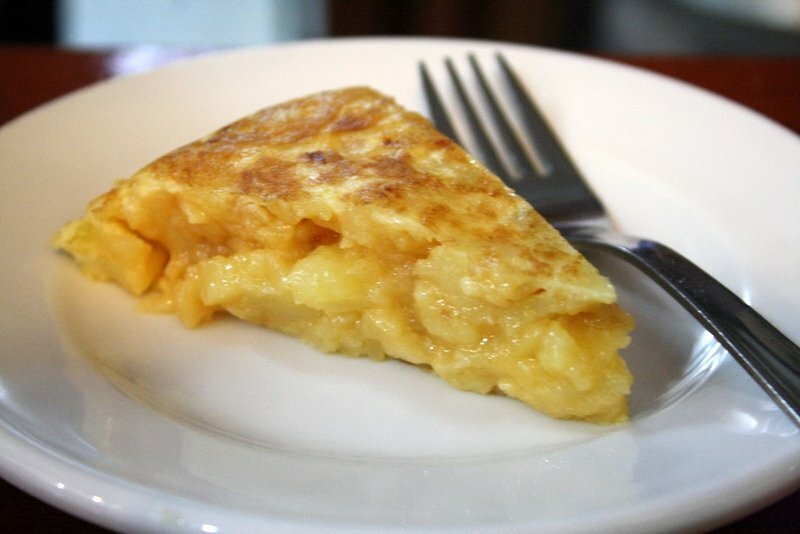 While the egg-and-potato omelette is not native to Cordoba, it’s still one of the best things you can eat while here. Whether you have it as a tapa on its own or bathe a whole slice in your bowl of salmorejo as locals often do, this simple delicacy is an absolute must. Want to try Cordoba’s most iconic tortilla? Tucked in between two tacky souvenir shops surrounding the perimeter of the Mezquita, Bar Santos (Calle Magistral González Francés, 3) is a tiny, no-frills, blink-and-you’ll-miss-it hole in the wall. The claim to fame here is their tortilla, which, despite its size (often weighing in at four kilos and measuring up to six inches tall!) remains unbelievably gooey and flavorful. While other tourists pass right by the bar en route to Burger King or Subway, locals get a slice of the famously thick omelette and a caña from Santos, then take it right outside to enjoy while sitting on the steps of the Mezquita itself. Make it: Lauren’s recipe is a great way to recreate this Spanish classic at home. I’ve said it before and I’ll say it again: Spain is a meat-lover’s paradise, and it shows in their plethora of mouthwatering grilled specialties. 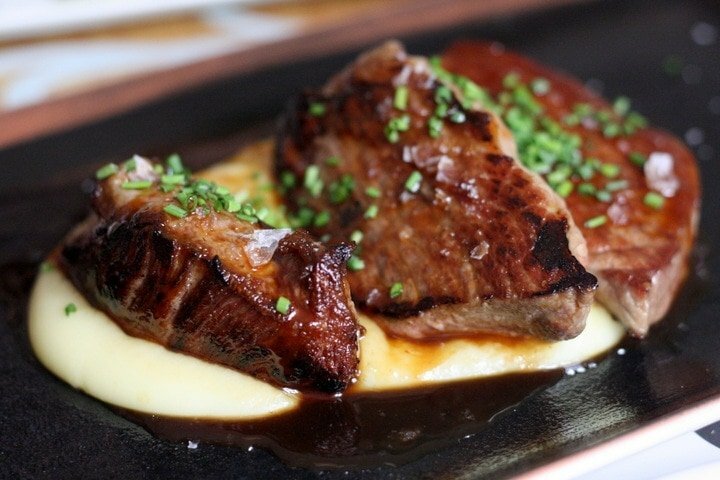 Churrasco is just that: a delectable slab of grilled-to-perfection meat, sprinkled with some coarse salt. That’s it! Here in Cordoba, though, you’ll often see churrasco cordobés. The local version of this simple dish doesn’t change the meat one bit (fortunately), but it does come with two tasty sauces: red (made with cumin, cayenne and paprika) and green (made with garlic, parsley, oregano and green chiles). 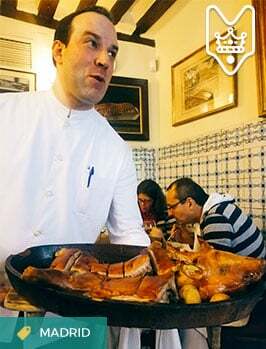 Which place serves the absolute best churrasco in Cordoba? That would be—wait for it—El Churrasco (Calle Romero, 16)! This timeless restaurant is legendary for their impossibly delicious grilled meats. Pair yours with a wine from their fabulous bodega (considered one of the best in Andalusia). One of the fun parts about eating at El Churrasco: you can grill your own meat exactly the way you like it. Spain may be famous for its Mediterranean diet, but when it comes to some of its most unique dishes, a few liberties are taken. Case in point: cogollos al ajillo. Garlic-fried romaine lettuce hearts. A local specialty here in Cordoba, this popular dish is sure to win over the tastebuds of even the most stubborn vegetable hater. Often relegated to an eternal role in salads and not much else, humble lettuce takes on new life as it fries to perfection in high quality olive oil with plenty of mouthwatering garlic. Eating your veggies never tasted so good! Where can you find the best cogollos al ajillo in Cordoba? The first time I tried this popular cordobés dish was at Bar Seneca. My boyfriend’s aunt and uncle own the place, so this might sound a bit biased, but trust me when I say that their cogollos would still take the top prize in my book even if I didn’t know their family. Despite its inland location a good hour and a half away from Andalusia’s sunny shores (my only real complaint about living here, especially in the summer! 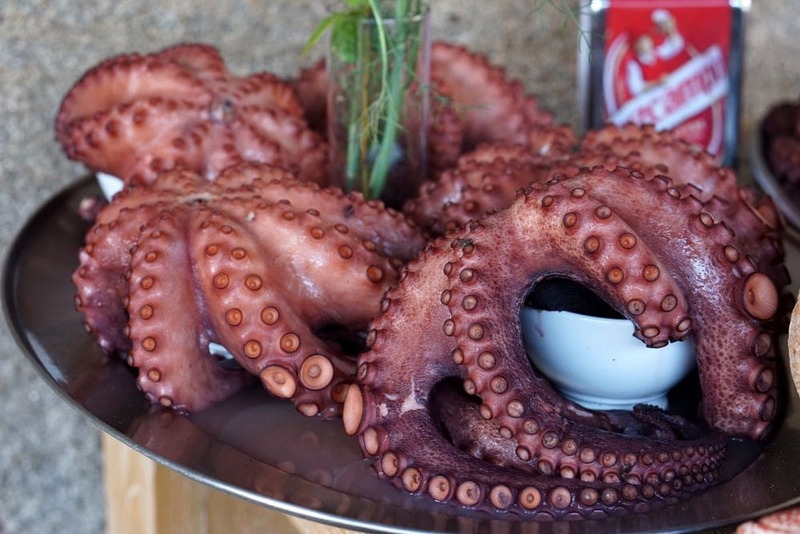 ), Cordoba is home to some seriously fantastic seafood. And while we might not have iconic dishes like Malaga’s espetos or Madrid’s gambas al ajillo, we do have our own hidden gem of a seafood specialty: japuta en adobo. Japuta (pomfret in English) wasn’t something I’ve ever heard of before coming to Spain. In other parts of the country, it’s known as palometa. Andalusia has held onto the word japuta since its Moorish days (it comes from the old Arabic word šabbúṭa), and the marinade that gives it its incredible flavor features Moorish influences as well. After marinating in the adobo mixture (recipes vary, but the most common mix includes oregano, garlic, paprika, cumin, olive oil and salt) for 24 hours, the tender chunks of fish are fried until they’re crispy on the outside and juicy on the inside. In other words, heaven on a plate! Fried fish en adobo always hits the spot. I’ve talked a lot about the must try foods in Cordoba, but chances are that no matter which of these tasty options you choose, you’ll need a good drink to go with it. There’s no better way to drink like a local than by ordering a glass of wine from Montilla-Moriles. 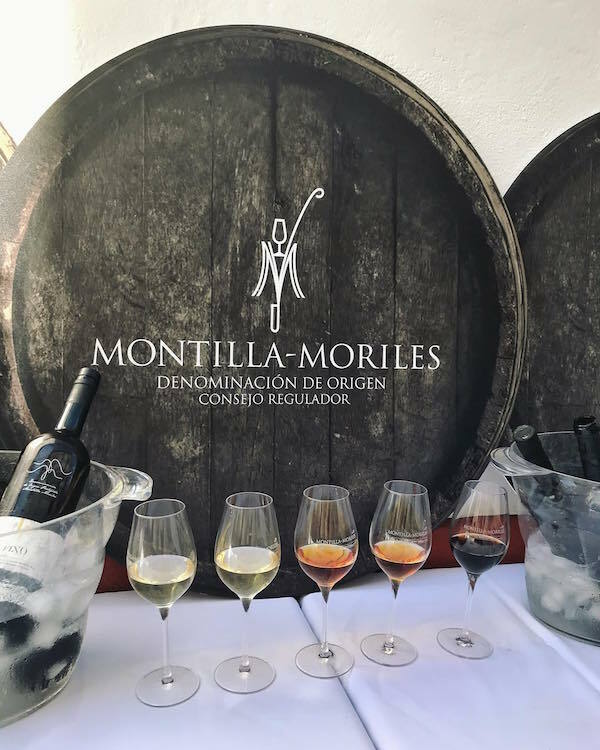 What is Montilla-Moriles like, exactly? If you’ve tried sherry, you already have an idea. Montilla-Moriles wines are practically identical to sherries, with a few important differences. Despite undergoing the exact same production process as their more famous cousins from Jerez, Montilla-Moriles wines are made with the Pedro Ximenez grape (sherries mostly use the palomino fino grape), are not fortified, and are produced exclusively in the province of Cordoba, more specifically in the two towns that make up the name of the D.O. The rest is nearly the same across the board. Just like sherry, Montilla-Moriles comes in a gorgeous spectrum of colors and flavors. From dry white fino to nutty amber amontillado (which gets its name from the town of Montilla!) to sweet ebony Pedro Ximenez and everything in between, there’s sure to be something for everyone, just like with sherry. As if you needed another reason to try this fabulous local wine while in Cordoba, consider the fact that only 10 of the D.O.’s 170 producers export their wines, making it nearly impossible to find outside of Spain. Take advantage and try it while you’re here! If you love sherry, don’t miss Montilla-Moriles! Last but certainly not least is something sweet! No matter which of these must try foods in Cordoba you decide on at last, be sure to finish it off with a slice of pastel cordobés for dessert. 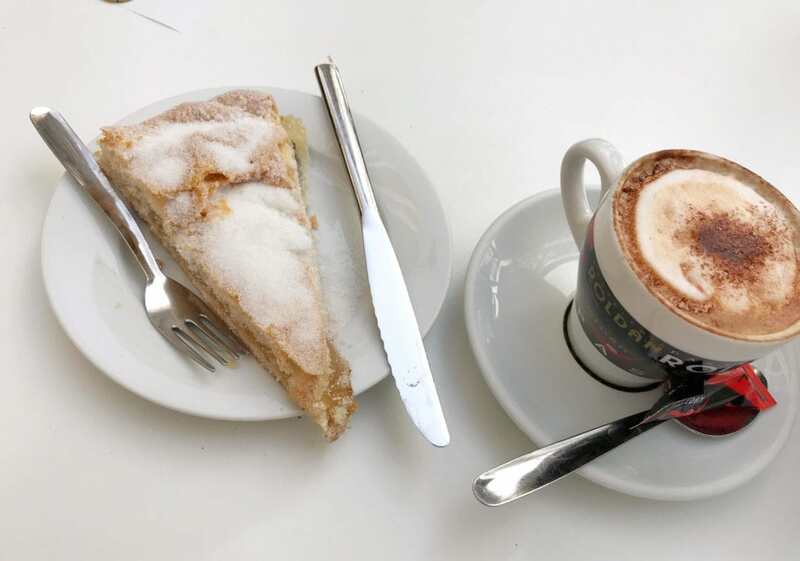 This sweet treat was invented right here in Cordoba, as its name implies, and it’s not easy to find outside the city. The pie has a puff pastry base and is filled with sweetened spaghetti squash. If you think that sounds strange, don’t be put off—I honestly thought the fruity filling was made of apples or pears the first time I tried it. With a light dusting of cinnamon sugar on top for an extra dash of sweetness, a slice of this unique pie and a cup of coffee or a glass of sweet dessert wine are the perfect way to end any meal. Pastel cordobés is the perfect finale to any meal! What do you think? Have you visited Cordoba? Any must try foods in Paris you think I’ve missed?